Published June 3, 2011 By Anna T. This post may contain affiliate links. Regardless, I only recommend sites I've researched and/or used and trust. InteliChek is an interesting money-earning opportunity. In a nutshell, you place calls to various businesses from your home phone and earn money. The best part is that you're NOT trying to sell them anything — instead, you're usually going to be making random inquiries about how much things cost, what hours businesses are open, and if these businesses have certain products available. You might be calling companies from anywhere in the United States, which is why it's better for you to have unlimited long distance if you decide to try this. If you've ever looked into work at home phone jobs, then you probably know that companies like Alorica, Live Ops, and many others demand NO background noise whatsoever. The great part about InteliChek is that background noise is actually desirable because you're essentially doing mystery shopping, and if the person on the other end hears background noise, then they are much more likely to believe that you are a potential customer rather than someone digging up information on them. So those of you with kids at home could definitely apply for a phone job like this with no concerns, since background noise doesn't matter. 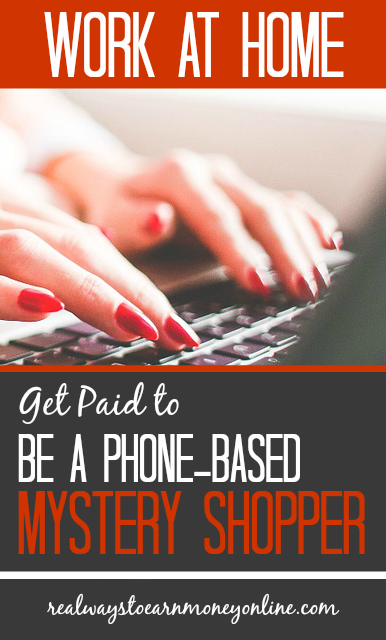 The mystery shopper salary at InteliChek depends on how many calls or “tasks” you complete. Pay for beginners starts at .90 per call/shop and it's not uncommon for some of their workers to bring in $50 to $100 per day. Most calls shouldn't take more than 3 to 4 minutes to complete. However, work isn't always available. Sometimes they'll have tasks there to claim and sometimes they won't. From what I understand, they occasionally send out emails to let workers know when new tasks will be available. I've never done any work for InteliChek myself, so I can't confirm how frequently they run out of tasks. It's probably not advisable to rely on InteliChek as a sole source of income. However, I do believe that it be an excellent way to earn extra cash for someone who really enjoyed the work. You work for InteliChek as an independent contractor, so taxes are your responsibility. They pay bi-weekly via check until you reach three star status, then payment is made via direct deposit. Additionally, if you earn less than $25 during the pay period, payment frequency is once monthly via check. You need to be able to commit to at least 20 hours per week if you decide to apply at InteliChek. You are free to keep any kind of schedule you want as long as you can let them know from week to week when you'll be available. InteliChek only considers applicants who are at least 18 years old and either a U.S. resident or authorized to work in the U.S. A U.S. mailing address and bank account are additionally necessary. High speed internet and an unlimited calling plan are also musts. One great thing about InteliChek is that you can use your cell phone to do your work. Many companies offering phone work from home require landlines, so this is a bonus if you only have a cell phone. Not everyone who applies will get in. After you email them your resume, you may have a phone interview and shopping test. Once hired, a “producer” monitors your work to ensure it's up to InteliChek's expectations. If you consistently perform well, the company may promote you to producer level. After acceptance, there is a training process to complete. Even though the work sounds easy enough, there's still a specific way InteliChek wants you to handle things before you just dive in and start calling businesses. You can earn more money as you get faster and faster at handling the calls. What do other people say about InteliChek? InteliChek is an opportunity I've seen recommended by others, so many people seem to enjoy it. However, I understand that you may want to look into this yourself, so here is a thread I found on WAHM where InteliChek is mentioned. I also like to check Glassdoor for reviews, and I did find one here that isn't so positive. If you're ready to start the application process, you need to email them your resume to info2@intelichek.com. Remember they're not always hiring, so you may not hear back right away. Their job information page is located here. It is now Sept. 2015 & I have an interview next month. How’s this job been going nowadays for those who have been doing it? What’ the very minimum hours a week you can work? How much do you make in the average week? After clicking the “here” link to go to the Intelichek website, I discovered that one of the requirements it to speak fluent French…? Is that right? There are actually three jobs listed. The top one is specifically looking for French Canadian people. But if you scroll all the way down to the bottom, you’ll see the last one appears to be open to people who speak English. After constant emailing to the first person who looked at my application the ball started rolling yesterday. I sent back my paperwork, got my login info and am ready. Only issue is because this happened late in the day Friday I can’t place my first call until Monday. Regardless though I am still excited and I think I can make this full time with hard work. Congratulations on getting the job! Just curious how things were going since you are the most recent poster. Are you liking the job? I hope you don’t mind me asking but what is the pay REALLY like? I just applied and although I keep seeing the 90 cents per completed task I am not sure how many tasks people are averaging per hour realistically. Thank in advance to anyone that can help me with that! I recently got offered an opportunity to work at InteliChek. I am in the training phase but so far I like it. I love the fact that this job requires zero selling. The work is simple but you have to keep organized and pay attention. This is going to be my full time job. I know some people do not agree with that for several reasons, but it is comforting to me. Congratulations, Ally. I hope you enjoy the work. Please feel free to comment back after you’ve started to let me know how it is going for you. I was curious , after they call you for an interview, what does the shopping text consist of ? I got hired on at intelichek last month. Some of the calls are recorded, some not. You don’t record them yourself, the system will do it for you. I had been using google voice which worked fine and no long distance fees. They are really not very picky about the phone you use. I’m not sure if they are still hiring people or not, but it might be worth a try. It took them about two or three weeks to get back to me after I initially applied in Sept. I probably won’t continue this work because I don’t like the constant lying to people, but it is not a bad gig, some of the task pay pretty well I would say average about $12 but sometimes it’s down to $7-8. There is work most days but not all, seems to have been about 4 out of 5 days a week. I was just about to ask if you can use Skype-type services to make the calls. Thanks for the info! When you do the phone calls are you required to record them or just do a written report? I think that when you talk you are somehow connected through IntelliChek and they are actually recording the conversation. Someone please feel free to correct me here if I’m wrong though.